Type 4962 Urethane Braided Suction Hose is an innovative flexible Suction / transfer hose designed to convey materials requiring an abrasion resistant FDA rated tube where a clear wall is desired. Lighter and more flexible than many rubber food hoses, yet durable, this hose also slides very well across plant floors. A copper grounding wire prevents hazardous static electricity build up (expose the ground wire and fold back so that it is trapped between the hose fitting and the hose wall). The smooth tube allows for superior product flow while the corrugated cover maximizes flexibility. 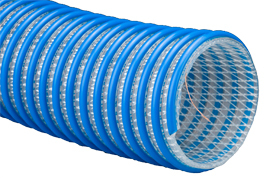 A PVC slinky is available to fill the deep corrugations allowing for a smooth banding surface.